Who is the toughest, deadliest, most bad@$$ “John” in movie history? Since the name John is pretty much the most common male name in the western hemisphere, I was forced to make some tough choices to keep the list trimmed to just 15. I kept the list strictly to movie characters only. So while a certain amount of ‘Street Cred’ is due to John Stamos for hooking up with a dangerous felon (Lori Loughlin) for years on Full House, he is not a “movie character” and therefore has no place on this list. Years before Keanu Reeves played the toughest and most loyal dog owner that ever lived (more on that later in this list), he portrayed Constantine on the big screen in 2005. As a suicide survivor, demon hunter John Constantine (Keanu Reeves) has literally been to hell and back — and he knows that when he dies, he’s got a one-way ticket to Satan’s realm unless he can earn enough goodwill to climb God’s stairway to heaven. For some additional terrific Constantine stories, make sure to check out his TV series and his run in the DC Vertigo Hellblazer graphic novels. Who doesn’t love a good assassin movie? And who doesn’t love looking at Angelina Jolie? Seriously, some of her movies are more enjoyable watched on mute, but Mr. & Mrs. Smith was not one of those! John (Brad Pitt) and Jane Smith (Angelina Jolie), a couple in a stagnating marriage, live a deceptively mundane existence. However, each has been hiding a secret from the other: they are assassins working for adversarial agencies. While no Oscar winning performances will be found in this film, it is still a fun script with some good action sequences mixed in. John Smith ain’t no-one to F with! Speaking of “no-one to F with”, Steven Segal put in the closest thing to a “believable performance” of his career as John Casey in 1992’s Under Siege. Steven Segal plays former Navy SEAL John Casey who is finishing out his tour on the Battleship Missouri as a cook after punching out a former C.O. (See? Told you he was a B.A.). Unfortunately, Tommy Lee Jones leads a horrible band that takes over the ship after their Silverstein Bar Mitzvah gig was canceled! This movie was released at the perfect time! Right when Steven Segal was at his “Steven Segal-iest” (i.e. before he started spending his weekends at the buffets) and just prior to Gary Busey being at his “Gary Busiest” (i.e. before he started spending his weekends at buffets of perspiration pills). Those that know me know I am a HUGE fan of the Ryan-verse novels! Even after the passing of writer Tom Clancy, the characters lived on through some terrific storytelling by multiple authors such as Mark Greaney. While I have nothing against Liev Schreiber’s performance in Sum Of All Fears, I really enjoyed Willem Dafoe’s turn as John Clark in Clear & Present Danger. Closer to source material and just better executed all the way around. Recently, talented actor Michael B. Jordan (Creed, Black Panther) has committed to a multi-picture deal to bring an updated John Clark to the big screen, probably based on the successful Rainbow Six video game series. I’ve got seriously high expectations for that! The radio station playing old commercials. Taco Bell winning the fast food wars. Dennis Leary. Has any film screamed 1990’s louder or more clearly than Demolition Man? With innocent victims caught in the crossfire in Los Angeles’ intensifying war on crime, both super cop John Spartan (Sylvester Stallone) and violent thug Simon Phoenix (Wesley Snipes) are sentenced to a state of frozen incarceration known as “CryoPrison.” When Spartan is finally thawed 36 years later, it’s 2032, and Los Angeles is now a pacifist utopia called San Angeles. We are now more than halfway to the year 2032 from the time this film was released and the Golden Arches still survives! But the biggest question John Spartan left us with is how the hell do you use the 3 sea shells!?! Kevin Spacey’s amazing performance in the 1995 thriller Seven made his career! When retiring police Detective William Somerset (Morgan Freeman) tackles a final case with the aid of newly transferred David Mills (Brad Pitt), they discover a number of elaborate and grizzly murders by a serial killer (Kevin Spacey) who is targeting people he thinks represent one of the seven deadly sins. Kevin Spacey’s John Doe is NOT someone you want to come across in a dark alley. Or a lighted alley. Or any alley at all for that matter. Seasoned veteran of the Delta Tau Chi House, John “Bluto” Blutarsky was one of the most memorable characters of the first National Lampoon film, Animal House. Ok, so I am taking some ‘writer’s privilege’ on this one, but you can’t argue the fact that Bluto is an experienced soldier in the art of culinary warfare (i.e food fights) and may have the toughest liver of anyone on this list! While not quit as memorable as the 1980’s television series, the 2010 feature film A-Team was still good old-fashion popcorn movie fun. Liam Neeson turned in a strong performance as John “Hannibal” Smith, but it is hard to see Neeson as any tough guy not named Bryan Mills. And honestly I thought Sharito Copley stole every scene he was in as Howling Mad Murdock. And nobody “Loves it when a plan comes together” quite like the late George Peppard! For John Connor, I am going with the Christian Bale version over the Nick Stahl or Edward Furlong one (I also pretend Terminator: Genysis never happened). We can all agree that Terminator 2: Judgement Day was by far the best sequel in the franchise. Although I did prefer Terminator 3: Rise of the Machines to Terminator: Salvation, but admittedly that isn’t saying much. John Connor is supposed to be the savior of the human race after Skynet (AKA Facebook’s A.I.) initiates Judgement Day. I thought Terminator 3, even with its short comings, set that up rather well. I also liked the idea of Skynet being a Napster inspired share-ware as opposed to a big piece of hardware. I am really hoping that the return of James Cameron and Linda Hamilton to the franchise with the upcoming Terminator movie will get this series and it’s iconic characters back on track! The morale of the United States Army was in a peculiar state in 1980. Coming off the withdrawal from Vietnam and still in the middle of the cold war with the Soviet Union, the United States Army needed a true American hero in the worst way. Enter Bill Murray’s John Winger from the hilarious movie Stripes! Winger was able to B.S. his way through training graduation, rescue his training class from a satellite Soviet nation and prevent a terrible mistake from morphing into World War III! All while talking himself into the pants of a beautiful MP! The Great Debate of our generation: Is it Die Hard best action movie of all time or the best Christmas movie of all time? From the moment Die Hard hit theaters in 1988, John McClane has been America’s favorite hard drinking, wise cracking, perpetually-hung-over sounding super cop. It is hard to imagine any actor other than Bruce Willis in this iconic role, but the original plan was for Arnold Schwarzenegger to headline the film. In fact, supposedly, the role was initially offered and turned down (thankfully) by Schwarzenegger, Sylvester Stallone, Burt Reynolds and Richard Gere. Yep, that Richard Gere. Just taking one look at John Matrix makes you wonder why would anyone would even think about taking this dude’s daughter!?! 1985 was probably the height of muscle bound cartoon violence at the movie cinema and perhaps no movie personified the ‘Age of Excess” more than Arnold Schwarzenegger’s Commando. To rescue his daughter Alyssa Milano and get her back in time for the filming of the following season of Who’s The Boss?, John Matrix must single handedly invade a tiny fictional island nation…you know what, never mind. The story is just Arnold cranking out zingy one-liners while killing dozens of random henchmen in various creative ways and blowing up a bunch of stuff . That’s about it. All jokes aside, PTSD is a serious ailment many of our returning veterans struggle with and we simply do not do provide a strong enough support system for them. In this regard, the original Rambo movie, 1982’s First Blood, was way ahead of its time. It took a serious look at PTSD through the eyes of a Vietnam vet dealing with severe emotional and mental trauma and the small town’s law enforcement, who didn’t understand how to deal with him. Beginning with the first sequel, Rambo First Blood Part II, the franchise entered the realm of over-the-top (Stallone pun intended) cartoon violence. It will be interesting to see how grounded the newest Rambo chapter will be when it hits theaters this Fall. Keanu Reeves second appearance on this list is one of my favorite characters: John Wick. Partially because he is an all around B.A. who dispatches Russian mobsters at the same rate I dispatch Totino’s pizza rolls. And partially because he is the only confirmed dog owner to make the list! The film makers drew from LA SWAT and Navy SEAL veterans to choreograph really tight, real-time close quarter fire-arm combat techniques, incorporating various martial arts including Judo, Brazilian Jiu-Jitsu and Krav Maga. The writers originally intended to cast a much older (60-something) actor for the role but decided to go with Keanu Reeves after working with him on the Matrix Trilogy, where John Wick directors Chad Stahlenski and David Leitch worked as stunt doubles. For some additional John Wick goodness, check out Andy Diggle’s John Wick comic book mini-series from IDW! I know John Wayne is an actor and not an actual character like the rest of my list, but since he pretty much always played the same exact tough-guy character (HIMSELF), I figure he counts. For a terrific and severely under-appreciated performance of Wayne, make sure to check out Wayne’s final movie: The Shootist. In the film, Wayne plays an aging gunfighter dying of cancer at the turn of the century and is forced to fight off younger shooters looking to cash in off his famous name. What did you think of my list? Did I make a mistake leaving John Kimble from the top 15? Did I miss any “Johns” that you think should have made the cut? As always, I appreciate any comments, “Likes” and shares. Thank you. Previous Geeky Daddy’s (Not Very Spoiler Free) Movie Review Of Captain Marvel! Next Sons Of Anarchy Stars To Lead ‘Yogis Of Anarchy’ Yoga Class At Motor City Comic Con! You made it difficult to choose a tough John! I kept saying ‘yes, this one,’ until I read the next choice, lol. I guess being John makes one tough. 🙂 Great list. John Winger in Stripes has my vote. Have you seen how many pushups he can do? How far he can fling a full pizza box at a moving car? You just can’t beat that! Oooh, that’s a tough call, but I think if I had to pick just one, I’d go with Bill’s John Winger – he’s brought us a lot of laughs over the years. I love the Die Hard movies. John McClane is no one to mess around with! What a fun list! I think I’m going to have to go with Rambo! I mean, he’s such a classic movie character and super tough. 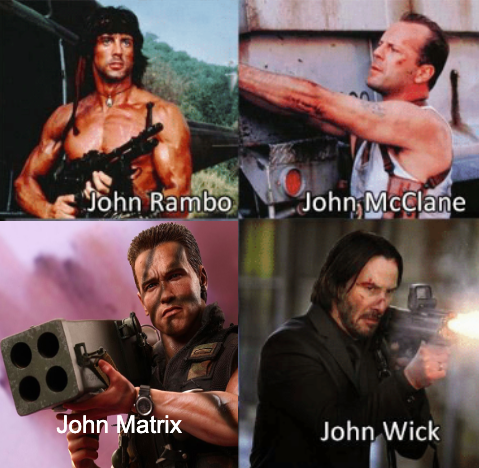 I had no idea there were so many badass men in movies named John. #14 and #1 are my favorites. I have to say I’m partial to Bluto. Animal House is one of my favorite movies, and Belushi’s character steals every scene he is in.